One million dollars are being sought on Kickstarter for a sequel to the long-running Ultima series of video games. The cash is being sought by legendary British developer Richard Garriott who created the original titles which helped define the fantasy gaming genre. Ultima gave rise to Ultima Online which was one of the first significantly popular massively multiplayer games. The PC game, called Shroud of the Avatar, is scheduled to be ready to play in October 2014. In an introductory video on the Kickstarter webpage Mr Garriott, often known by his in-game alias Lord British, said the current crop of fantasy video games had become too formulaic and scripted. Instead, he said, Shroud of the Avatar would be a much more open experience in which players were free to follow their own path. It would be more about playing a useful role in an online world than just racking up kills and loot to make a character more powerful, he said. 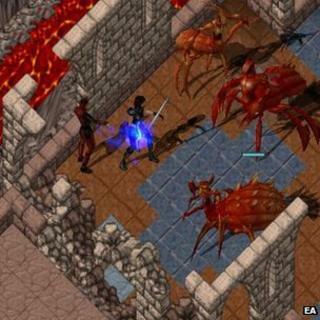 It would also take some elements from Ultima Online such as player housing and a detailed crafting system. Work had already begun on the game, said Mr Garriott, but those backing it via the crowd-funding site would also get a say in how it would be built. Alec Meer, a writer at games news site Rock Paper Shotgun, expressed surprise that Mr Garriott had to appeal for funds via Kickstarter given that in 2009 he spent millions of dollars to take a trip into space. "It's just a shame to see so many already wealthy industry old-hands making hay with all these old-fashioned role-playing games when so many dramatically more inventive and ambitious ideas from smaller studios are failing to reach their targets," he added. Shroud of the Avatar is being created by a company called Portalarium that Mr Garriott set up after the failure of an online game called Tabula Rasa that he helped to develop.